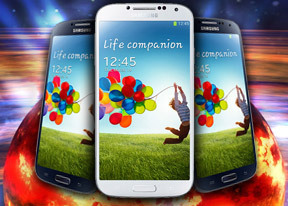 The Samsung Galaxy S4 comes with a number of advanced features enabled by the powerful hardware and dedicated sensors. The first is Air View, which debuted on the Galaxy Note II and worked with the S Pen. There's no S Pen on the Galaxy S4, or a need for it - the phone can detect your finger hovering over the screen. This enables information preview (e.g. SMS text, calendar entry text and so on), previewing videos just by pointing to a spot in the timeline, the next track in the music player by hovering over the next button (works with previous button too), previewing folders, speed dial contacts, and magnifying links in web pages. Air view detects fingers 1cm / 0.5" away from the screen, so there's no danger of accidentally tapping the screen when you wanted to use Air View instead. Another set of "air" features are the Air Gestures. Quick Glance is one of them, but there's more. The rest of the air commands are triggered by waving your hand over the Galaxy S4. You can use this to scroll web pages in the browser (vertical waves), switch between tabs (horizontal waves), move between tracks in the music player and photos in the gallery, accept a call and move app shortcuts and S Planner events. Air Gestures can detect your hand up to 7cm (just under 3") and might prove useful in some situations. Note that only the native apps support them, third party apps will not work with them (even Chrome that comes preinstalled on the phone). The familiar Smart Stay and Smart Rotate features are enabled too. Stay prevents the screen from locking as long as the front-facing camera can see your face (great for reading) and Rotate uses the orientation of your face rather than accelerometer info to decide how to rotate the screen. Smart Scroll is one of the two new features - it allows you to scroll up and down by tilting the phone or by tilting your head. It's a bit hard to get it right the first time, but after that you can tilt your head down to scroll down and up to scroll back up. The second new feature is simpler and more useful - Smart Pause. While watching a video, it uses the front-facing camera to track your face and will automatically pause the video when you look away. Look back and the screen and the playback continues. Then there are a number of motion gestures, which are not exactly new. There's direct call (dial the contact whose info you're currently viewing by lifting the phone up to your ear), smart alert (makes the phone vibrate when you pick it up if there are missed events), zooming and panning in the gallery, a shake of the phone to refresh the list of Bluetooth devices and muting alarms or pausing music playback by putting the phone face down. You can also pause the music player by putting your palm on the screen. A palm swipe takes a screenshot. S Voice is Samsung's answer to Apple's Siri and is present on the Galaxy S4. S Voice can be used to initiate a call, dictate text, play music, open an app, change a setting, make a memo (including voice memo), add a reminder, schedule an event, set an alarm or timer, check the weather, do a search on the internet, look for local listings (e.g. nearby restaurants) and even get an answer to a question. S Voice does duplicate parts of Google Now, but being less search focused it tries to do more on the actual phone and it has some added features. Some of these are available outside of S Voice too, so you can set the Galaxy S4 to answer a call, snooze an alarm, take a photo and what not by voice commands even when S Voice isn't running. The problem with S Voice is not nearly as fast or as accurate at recognizing your speech input as Now. Naturally, being a Jelly Bean smartphone, the Galaxy S4 also comes with Google Now. It provides traffic information to your work or home, knows those scores of sports teams you follow, gives you the weather forecast for your city and can even tell you who Kevin Spacey is. Google Now also has its own separate widget on the homescreen.